Jana, Janulik and I are wishing you all a very merry Christmas! May your friends and families realize the joy, love and peace of God during this season, and may we all dedicate our lives anew to enlisting in God’s army of peacemakers around the world. 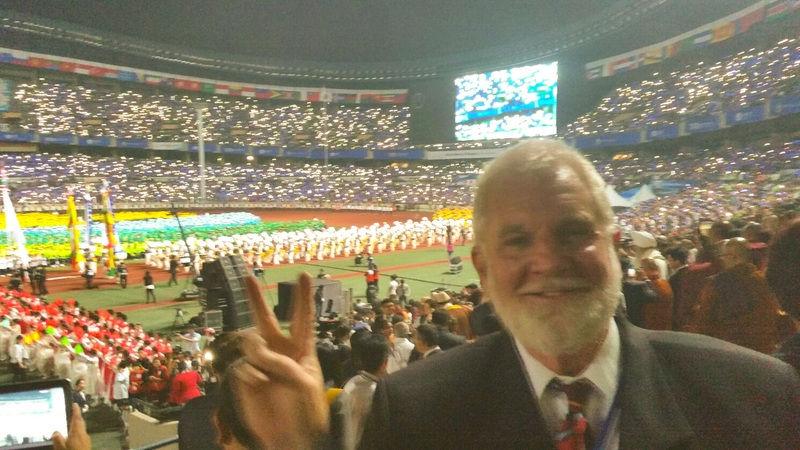 My work here in the Middle East, in the field of religious reconciliation and Middle East peace continues. This morning I was thinking about all the new friendships I’ve made while being here. I thank God for all these new friends from so many different nations–Kenya, Somalia, Ethiopia, Sudan, Yemen, Egypt, Jordan, Lebanon, Turkey, Palestine, Israel, Syria, Iraq, Myanmar, Bangladesh, India, Indonesian, the Philippines, China, Pakistan, Bahrain, Iran, UAE, Oman, Qatar, Kuwait and, of course, Saudi Arabia. I’ve learned a lot about all the different cultures and faiths here and in other parts of the world, and they are learning about America through me. All of our peoples face difficult challenges today. There is so much political and economic unrest, but we do not live as those who have no hope! During the next few days, I hope to join Jana and Janulik in the Carpathian Alps of northern Slovakia for a very white Christmas and New Year’s holidays. Pray that this will be possible. Despite international wars and conflicts, and despite the tragic gun violence in our own beloved America, we must not lose heart. As we celebrate Jesus’ birth, let us rededicate our lives to the peace work God has commisioned us to do. To our Jewish, Muslim and Christian friends in America and around the world, we love you, and we thank you for your prayers, correspondence and encouragement during the past year! May God’s perfect peace be ever present with you and yours! 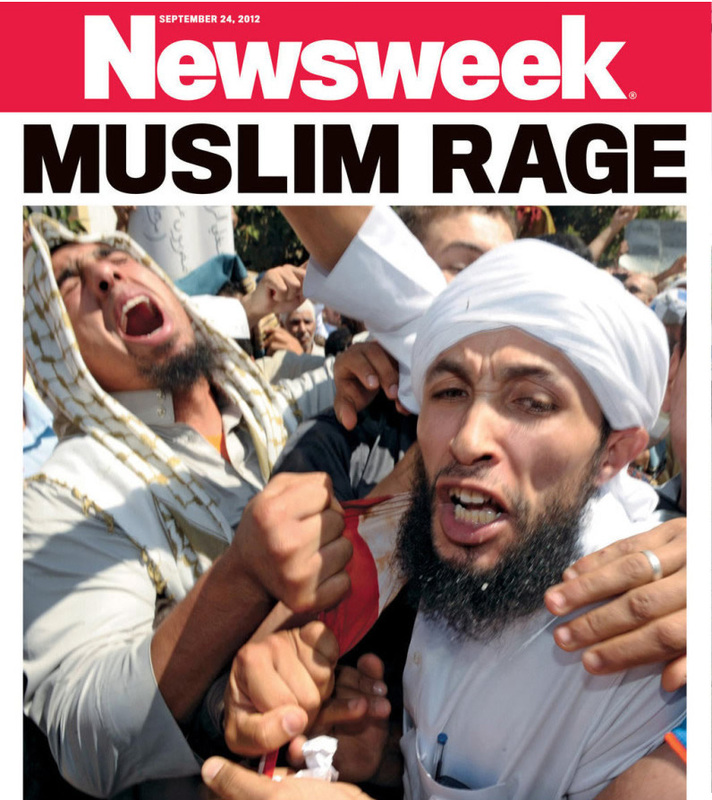 This week’s Newsweek magazine cover featured raging Muslims, but how many were really angry? What’s really behind the outrage? Newsweek‘s recent cover-story featured the bold words “Muslim Rage” and depicted most of the world’s Muslims as angry with the US and the West. Here’s a different perspective of what is happening around the world — much of the information was given to me by the French arm of the activist think tank AVAAZ. According to AVAAZ, there are a number of very important items we have missed in the midst of all the sensational, tabloid-like reporting. 1. Early estimates put participation in anti-film protests at between 0.001 and 0.007% of the world’s 1.5 billion Muslims – a tiny fraction of those who marched for democracy in the Arab spring. 2. 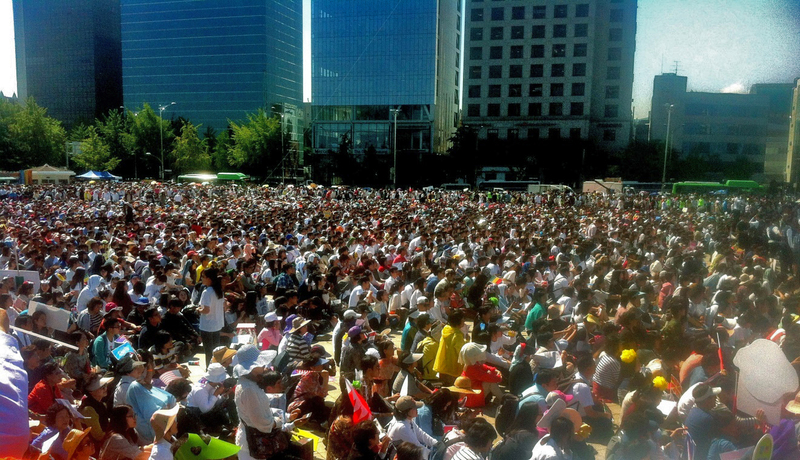 The vast majority of protesters have been peaceful. The breaches of foreign embassies were almost all organised or fuelled by elements of the Salafist movement, a radical Islamist group that is most concerned with undermining more popular moderate Islamist groups. 3. Top Libyan and US officials are divided over whether the killing of the US ambassador to Libya was likely pre-planned to coincide with 9/11, and therefore not connected to the film. An investigation by both the US and Libyan governments is underway. Think-tank AVAAZ estimates that less than 0.007 of Muslims protested against the hateful anti-Muslim film during the past several weeks, but both Christians and Muslims are known for their few “crazies” who prefer violence over dialogue and peaceful protest. 4. Apart from attacks by radical militant groups in Libya and Afghanistan, a survery of news reports on September 20 suggested that protesters had killed a number of people. The deaths cited by media were largely protesters killed by police. 5. Pretty much every major leader, Muslim and western, has condemned the film, and pretty much every leader, Muslim and western, has condemned any violence that might be committed in response. 6. The pope visited Lebanon at the height of the tension, and Hezbollah leaders attended his sermon, refrained from protesting the film until he left, and called for religious tolerance. Yes, this happened. 7. After the attack in Benghazi, ordinary people turned out on the streets in Benghazi and Tripoli with signs, many of them in English, apologizing and saying the violence did not represent them or their religion. Add to that the number of really big sensational news stories that were buried last week to make room for the front page, “angry Muslim clash” coverage. Maybe you didn’t even hear that in Russia tens of thousands of protesters marched through Moscow to oppose Russian President Vladimir Putin. Hundreds of thousands of Portuguese and Spaniards turned out for anti-austerity protests; and more than a million of Spain’s Catalans marched for independence. Muslim rage or radical Salafist strategy? Meet Sheikh Khaled Abdullah, the radical Salafist TV host who incited violence against US embassies because of the American anti-Muslim hate film. The Amercan anti-Muslim film “Innocence of Muslims” was picked up and heralded with subtitles by far-right Salafists – radical Islamists. The film was a cheaply made, YouTube failure until a radical Egyptian Salafist TV host, Sheikh Khaled Abdullah began promoting it to viewers on September 8. Most insulted Muslims ignored the film or protested peacefully, but the Salafists, with their signature black flags, were leading instigators of the more aggressive protests that breached embassies. 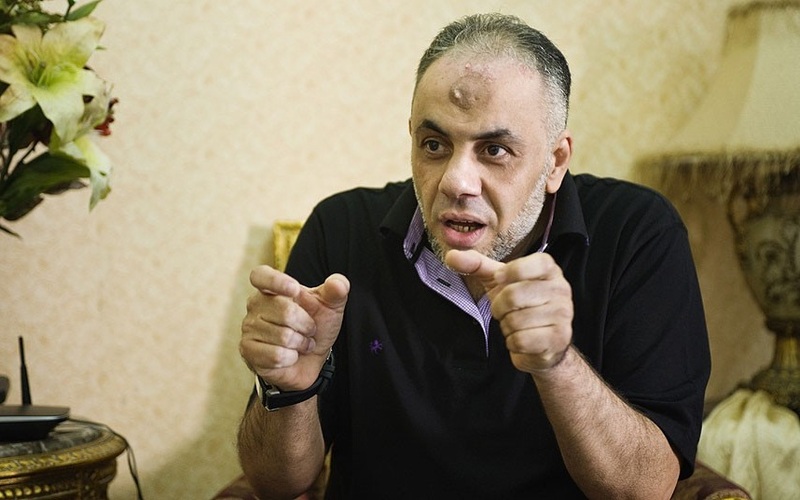 Leaders of the Egyptian Salafist party attended the Cairo protest that broke into the US embassy. Like the far-right in the US or Europe, the Salafist strategy is to drag public opinion rightwards by seizing on opportunities to fan radical anger and demonise ideological opponents. This approach resembles that of anti-Muslim US Charismatic Christian pastor Terry Jones (who first promoted the film in the west) and other western extremists. In both societies, however, the moderates far (far!) outnumber the extremists. Most print media and radio/TV journalism is about readership/viewership/listenership polls (ratings). The ones with the best ratings can charge higher prices for advertising. And, far too often, its about sensation and greed at the expense of truth. Whenever a lie is told or an exaggeration is promoted as “truth” the result is misunderstanding, alienation and, far too often, these lead to conflicts and even war. A lonely band of journalists and scholars, however, have approached the protests with an intent to truly understand the forces behind them. Among them, Hisham Matar, who powerfully describes the sadness in Benghazi after US Ambassador Christopher Stevens was killed, and Barnaby Phillips, who explores how Islamic conservatives manipulated the film to their advantage. Anthropologist Sarah Kendzior cautions against treating the Muslim world as a homogenous unit. And Professor Stanley Fish tackles a tough question: why many Muslims are so sensitive to unflattering depictions of Islam. 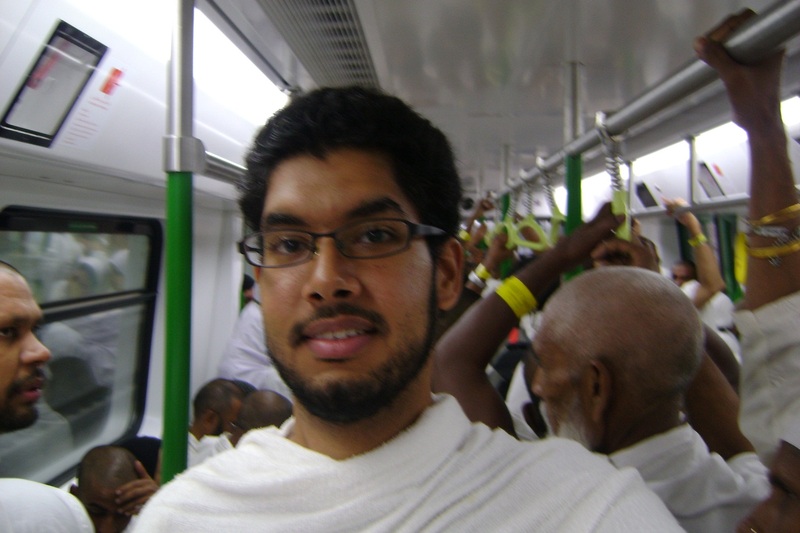 And then there was our own blog that reported that all was well in both Mecca and Medina–the two most holy cities of Islam. The insulting Islamophobic film was barely mentioned in the news media in Saudi Arabia, and Saudi Muslims basically ignored the inflamatory film. Makkah Gov. Prince Khaled Al-Faisal urged Saudi youth to “confront the anti-Islam smear campaign by leading an exemplary life, following the teachings of the Qur’an and Sunnah.” The Saudi government early on condemned the violence and attacks on US embassies. Sam joined a Jeddah city councilman and professors from King Abdulaziz University in organizing an environmental committee for meeting the challenges of plastic debris overwhelming the Arabian peninsula. 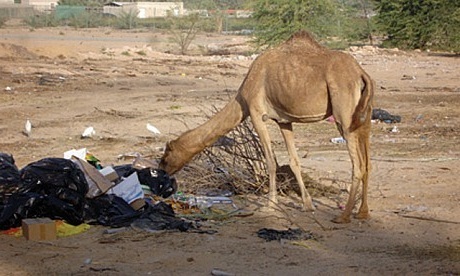 Hundreds of camels die on the Arabian peninsula every year from ingesting plastic bags. 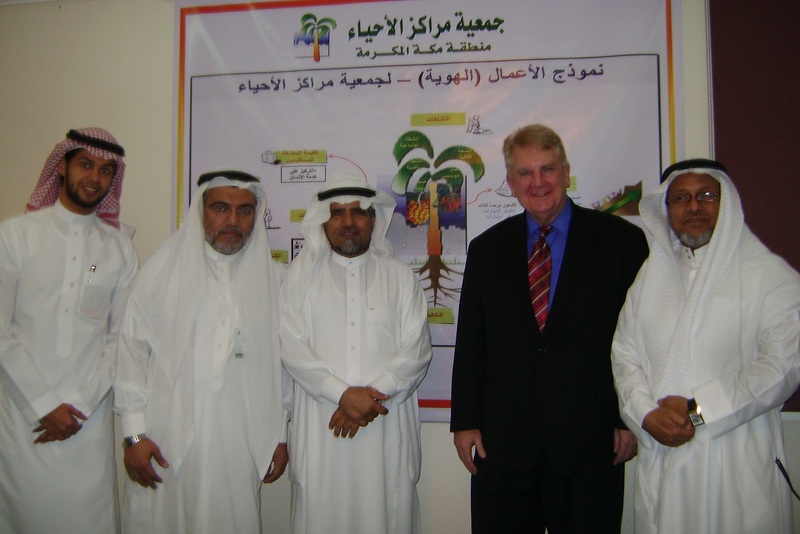 I am a proud founding member of a Jeddah municipal committee to study many of the environmental problems adversely affecting the Arabian peninsula. We will suggest solutions, improving life here for people and animals alike. Saudi Arabia is a good country. Our committee has strong support from the Jeddah City Council and is made up of area professors and engineers with a common mission of correcting many of the harms now contributing to Saudi environmental degradation. Having provided leadership in the United States for clean air, banning phosphate fertilizers, banning plastic retail carry-out bags, banning the hormone-disrupting chemical BpA (bisphenol-A) from baby bottles, etc., I am able to advise my Saudi colleagues on environmental matters. Our committee will begin by researching several known challenges in our Jeddah community–one being plastic debris. Plastic bags and bottles cover the banks of the Red Sea, are scattered about through the deserts, line city streets, and fill public landfills. Hundreds of camels and thousands of sheep and goats die annually from ingesting plastic bags. They are also killing marine life in the Red Sea and the Arabian Gulf. If the Abrahamic faiths of Muslims, Jews and Christians believe God created the world, then it follows logically that we must honor God by caring for his creation. As believers in the God of Abraham we must respond to the damaging influences of over-consumption and pollution that are ruining planet Earth. Believers are well equipped to respond to the many environmental crises—including the larger problem of climate change/global warming. 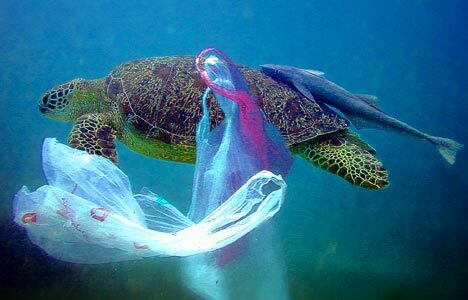 Plastic bags can be deadly for marine life which often mistakes plastic bags for food. We read in the Qur’an, “There is the type of man whose speech about this world’s life may dazzle thee, and he calls God to witness about what is in his heart: yet is he the most contentious of enemies? When he turns his back, his aim everywhere is to spread mischief through the earth, destroying crops and cattle. But God loves not mischief” (Al-Baqarah: verses 204 and 205). In the Torah we read, “The Lord God took the man and put him in the Garden of Eden to work it and take care of it.” (Genesis 2:15). The Torah also commands us, “You shall not pollute the land in which you live…. You shall not defile the land in which you live…” (Numbers 35:33-34). We believers cannot by our own efforts, “save the earth.” Only God, who is the Creator, Sustainer and Redeemer of all creation, can do that. But we are expected to join God in maintaining his work. We seek to right many of the wrongs we’ve committed. In our homes, in our schools, at our places of work, in our times of recreation, and in our places of worship, we can begin to model creation care. Sam’s efforts to ban plastic debris are known worldwide. 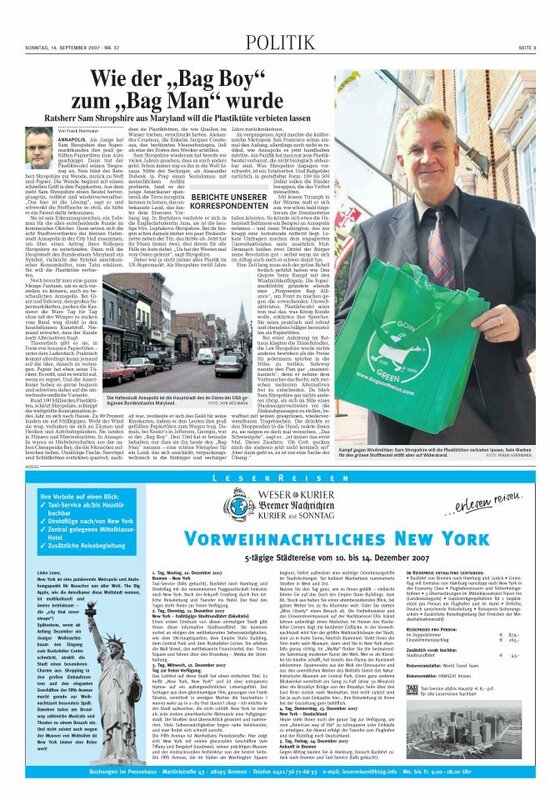 Here’s an article from the The Sontagg, Dusseldorf, Germany. (Click image to enlarge). by our abuse of earth. that feed on culture’s greed. to tend our world in need. for creatures great and small. that harms both sea and land. 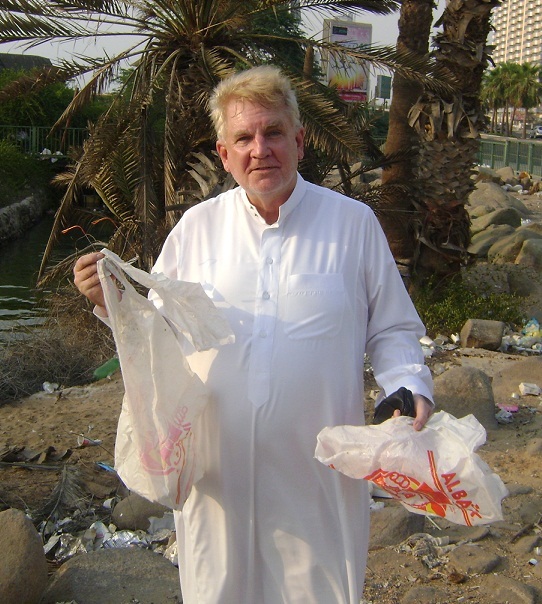 Sam holds a couple of loose plastic bags he found on the ground in Jeddah, Saudi Arabia. Leaders of the Jeddah community are campaigning to rid the city of plastic debris that lines the streets. “We are a growing community of faithful people from many religious traditions who have decided to work together to save the Earth. We have put aside our religious differences to focus on what we share in common: an understanding that global climate change is threatening our world and a commitment to do something about it. If you share those two beliefs with us then you are already a part of The Genesis Covenant. We are not an organization. We are a community of volunteers from all walks of life. We are people with strong personal religious convictions. We honor that in one another. We do not debate our differences. We celebrate what we share in common. We express our faith through action. We work together not just because we agree, but because we care. We are many traditions united for a single purpose. Here’s a simple way you can make a difference. When you do your grocery shopping refuse plastic carry-out bags. Show that you care about the environment by using reusable shopping bags. One reusable bag, when used consistently for a year, will replace hundreds of plastic bags. The impact of plastic bags is long-lasting. Because of the chemical composition, a plastic bag takes between 500 to 1000 years to decompose. In the US alone more than 100 billion of these plastic bags are distributed by retailers annually. And they are accumulating by the 100s of billions in our landfills, forests and waterways. Not only are these ubiquitous bags an eye-sore in our communities, the consequences of these bags for marine life and animals are often tragic. Many cities, states and nations are banning plastic carry-out bags. While bans on these bags are sweeping the United States, many other nations including China, France, Ireland, England, Kenya have either banned the bags outright or put restrictions on their use. Plastics have so polluted the earth’s oceans that there is now a swirling “soup” of plastic in the North Pacific gyre, at times the size of Africa. But the evidence of the plastic pollution of our waterways and oceans is evident throughout the planet. And it’s accumulating day by day. The United Nations is encouraging the world’s nations to halt the distribution of plastic carry-out bags. “Some of the litter, like thin film single-use plastic bags which choke marine life, should be banned or phased-out rapidly everywhere. There is simply zero justification for manufacturing them anymore, anywhere,” says Achim Steiner, UN Under-Secretary-General and United Nations Environmental Program executive director. I invite NASA to visit Saudi Arabia! Martian landscape looking eerily like that of the Arabian Desert. The NASA rover Curiosity landed safely in the Gale Crater on August 2012. So, I confess. I’m a space buff—have been since 1970. That’s when I took a course in astronomy at Shelton College. During the past month I’ve been closely following NASA’s Curiosity landing. What an incredible accomplishment—an SUV-sized rover that travelled three-and-a-half months to the red planet, descended like a fire ball through the atmosphere during what NASA called “seven minutes of terror” and then parachuted to the martian surface landing at nearly pinpoint accuracy in the Gale Crater. Curiosity carries the biggest, most advanced suite of scientific instruments ever sent to Mars. The rover will analyze organic samples scooped from the soil and drilled from rocks. According to NASA scientists, the record of the planet’s climate and geology is essentially “written in the rocks and soil.” The rover is looking for the chemical building blocks of life (e.g. forms of carbon) on Mars and will assess what the martian environment was like in aeons past. Now studying the planet Mars, one might think, means travelling there or exploring only by means of satellites, landings and robots, but that’s not the case. NASA has a Mars research program going on in Mexico’s Chihuahuan Desert, where the vast, scorching plain is said to be very much like ancient Mars. The NASA scientists working in this largely arid and extremely hostile climate are looking for organisms able to survive on a minimum of nutrients, high salinity, soaring temperatures and high ultraviolet radiation. Take a look at the following photo and the photo (inset) that was beamed back from Curiosity to the NASA Mission Control Center in Pasadena, California. It arrived just a couple of days ago. You’ll recognize the incredible similarities between the Arabian desert and Mars’ Gale Crater—pink reddish sand and dust with black volcanic formations and scattered stones. The Saudi mountains and desert landscapes look weirdly similar to the Martian plains and mountains. Here in Saudi Arabia the desert temperatures and climatic conditions are even more radical than those of the Chihuahuan Desert in Mexico. Temperatures sometimes sore to 140 degrees Fahrenheit, yet there still exists various forms of life in this grueling climate, including the infamous, giant camel spiders! Sam is proud of America’s accomplishments in space. This is his friend Astronaut Charlie Duke during Charlie’s 1972 Apollo 16 moon walk. 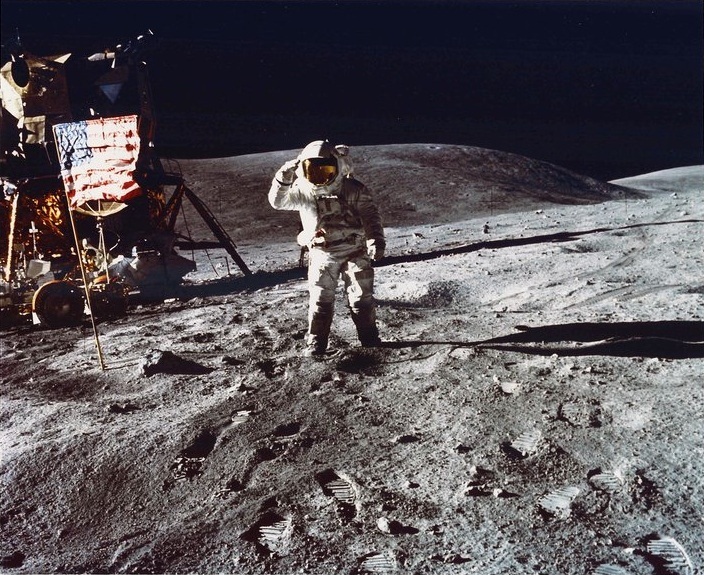 Charlie was the 11th man to walk on the moon. Sam spent time with Charlie and his wife Dottie at their home in New Braunsville, Texas. All the holy books of the Jews, Christians and Muslims have a lot to say about the universe. The prophet David wrote in the Psalms, “When I consider your heavens, the work of your fingers, the moon and the stars, which you have set in place, what is man that you are mindful of him?” (Psalm 8:3 and 4). And in the Qur’an we read, “Consider (think about) the sky that is full of great constellations” (85:1). I like gazing up into the Saudi night skies. The stars, planets and moon seem brighter than back home, and the sun appears twice as big as it sets over the Red Sea in the evening sky. By faith I stand in awe of God who is at this very moment millions of light years away among the galaxies, and at this same moment He is also here and is concerned about the plight of the men, women and children of earth. We are taught in the Torah, the Psalms and the Gospels that we humans were created to fellowship with this God (Allah)—to glorify God—to enjoy God forever. Unfathomable! The wonder of it all! 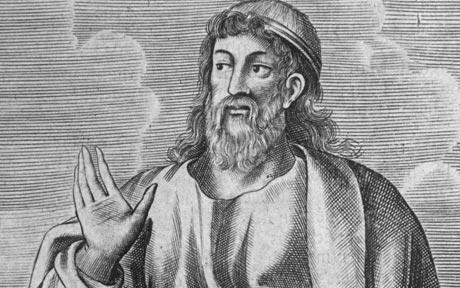 Plato and other ancient philosophers developed the cosmological argument for the existence of a divine Creator. When we gaze into the night sky, beholding the cosmos of space, how can we not consider God’s existence and his greatness? The “cosmological argument” for God’s existence derives its title from observing what we can see of the world around us. It begins with what is most obvious to us–the fact that things exist. 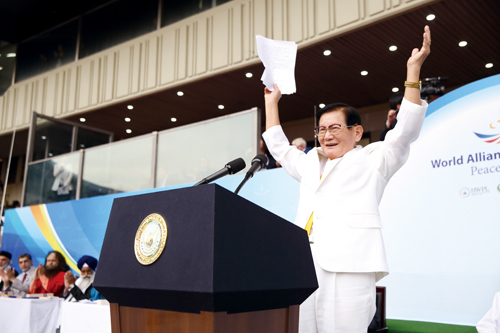 It is then argued that the cause of those things’ existence had to be a “God-type” being–a Creator. Beginning with Plato, these types of arguments have been put forth by renowned theologians and philosophers. And almost in reverse order of what one might expect, science seeminly caught up with theologians in the 20th century when it was confirmed that the universe had to have had a beginning. In 1912, the American astronomer, Vesto Slipher, made a discovery noticing that the galaxies were moving away from earth at huge velocities. These observations provided the first evidence supporting the expanding-universe theory. Then the “Big Bang” was theorized by leading scientists. The theory was originally postulated in the late 1920s by Georges-Henri Lemaître, a Belgian Catholic priest and astronomer. The theory advanced the concept that our universe was expanding, having originated from one highly super concentrated mass. While the Big Bang theory does not provide any explanation for such an initial condition, it describes and explains the general evolution of the universe from that point forward. But how did it all start? Do our Abrahamic faiths hold any answers? The cosmological argument advances that since there was that scientifically accepted beginning, there then had to be a cause. In the movie Star Wars the cause was called “the Force.” Muslim, Christian and Jewish philosophers of faith agree that the Force is none other than the Eternal One–God (Allah). There are remarkable statements in the Torah, the New Testament and and the Qur’an that appear to confirm the Big Bang! The first words of Genesis read, “In the beginning God created the heavens and the earth.” In the New Testament book of Hebrews, (chapter 11, verse 3), we read these amazing words, “By faith we understand that the worlds were framed by the word of God, so that the things which are seen were not made of things which are visible.” When reading the Qur’an I came across this amazing verse, “Don’t the unbelievers see that the universe was once joined together, then God burst it apart. God made from water every living thing. Will they not then believe?” (21:30). One of the primary objectives of NASA’s Mars probes has long been the search for water on the “Red Planet.” Water, NASA says, contains the building blocks of life. 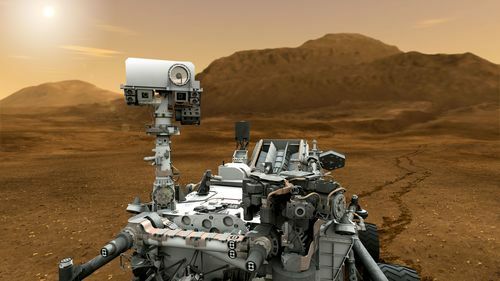 NASA announced November 18, 2012, that, aside from scooping and analyzing Martian soil, Mars rover Curiosity’s measurements of wind and radiation patterns on Mars are helping researchers better understand the environment near the surface of Mars. Researchers with the Mars Science Laboratory mission have identified transient whirlwinds, mapped winds in relation to slopes, tracked changes in air pressure, and linked radiation changes to atmospheric changes. The goal of the mission is to discover whether the environment in Gale Crater, where Curiosity landed earlier this year, could ever have been habitable for microbes. It’s official now! The new moon was sighted two days ago, ending the 30 days of Ramadan. Now we are in the middle of three-days of the public holiday called Eid-al-Fitr (Arabic: ‎عيد الفطر ‘Īdu l-Fiṭr). The holiday is most often simply called Eid. Foreigners and Arabs alike greet one another with the common greeting, “Eid mubarak!” (English: literally “Happy Feast!”). In most Muslim countries celebrants dress in their best clothes and adorn their homes with lights and other decorations. Old wrongs are forgiven and money is given to the poor. Special foods are prepared and friends or relatives are invited to share the feast. Eid is a joyous occasion. Its underlying purpose is to praise God and give thanks to him. More than 2.2 billion Muslims are celebrating Eid around the world! 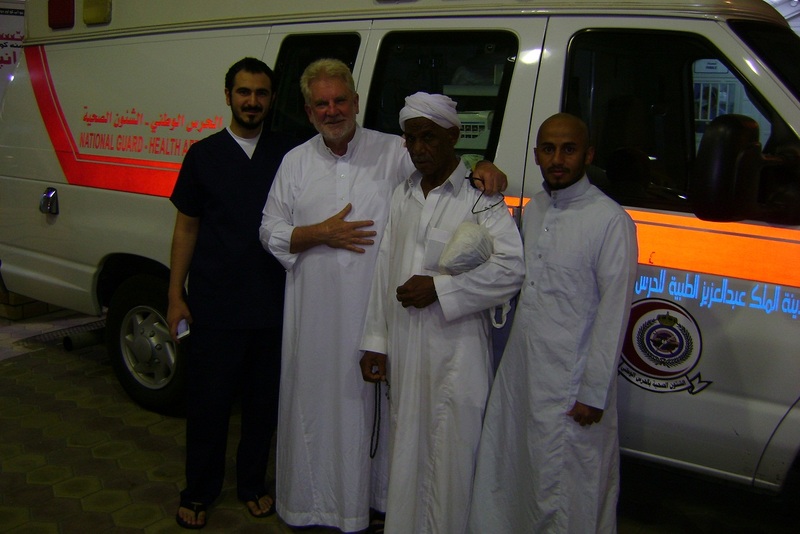 Eman Kaskas oversaw the distribution of food to needy Ethiopian families of Jeddah. Eman also conducted a fundraising dinner for the Dar al Aytam children’s outreach in Lebanon. 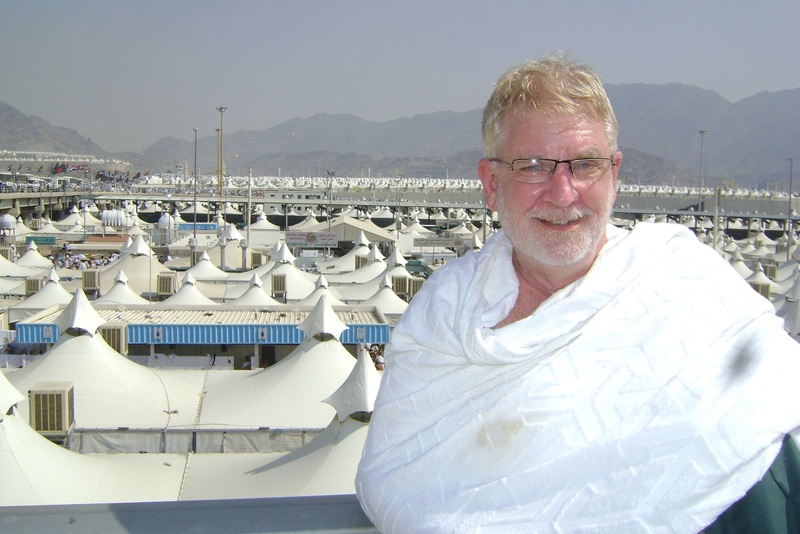 During my first Ramadan celebration, I often joined my Muslim brothers and sisters in fasting and prayer at our local neighborhood Al Takwa Mosque. I also went along to help distribute food and other gifts to the poorer immigrant populations of Jeddah. Eman Kaskas and the students of the British International School had collected more than two tons of canned meats and vegetables, soups, dates, spices, bags of rice and pastas for distribution. This very generous collection was distributed to Ethiopian immigrant families. Numerous fundraisers were conducted throughout Jeddah and other Saudi cities during the past month to benefit various causes for children, the disabled, the poor and the elderly. Dr. Safi and Eman Kaskas invited guests to a dinner at the Sands Hotel which raised thousands of dollars for the Dar al Aytam children’s home in Beirut, Lebanon. Close to a hundred guests gathered that evening to lend their support to this orphanage that was established nearly a hundred years ago to care for Lebanese orphans of World War I. Since that time Dar al Aytam has expanded its programs to provide services to the mentally disabled as well as homeless children. Services are now available in more than 30 locations (Greater Beirut, The Bekaa Valley, Mount Lebanon, and in various other northern and southern locations). 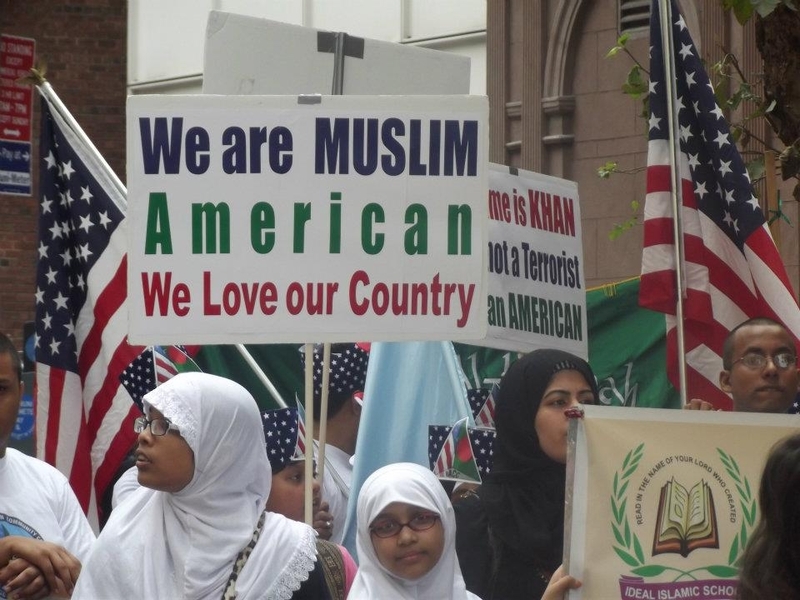 Some American Christians expressed solidarity with Muslims during this special holiday. The Rev. 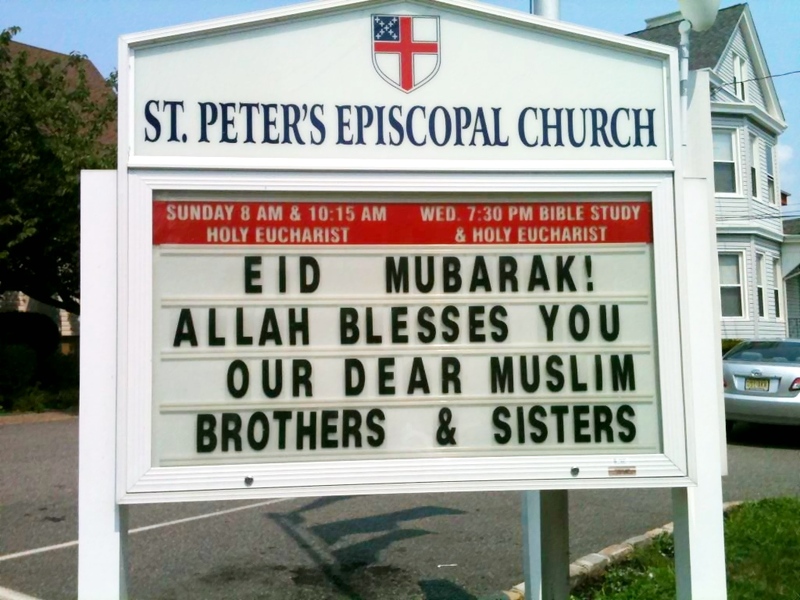 Peter De Franco and the congregation of St. Peter’s Episcopal Church in Clifton, New Jersey, used Eid as a time to show support for Muslim believers in their town. This past Thursday, a Palestinian American was visiting his father’s grave at a Muslim cemetery in Evergreen Park, a suburb southwest of Chicago, when he noticed obcene graffiti written on the tombstones. During the past month, seven Islamic centers, from California to Rhode Island, have been attacked.In one of the attacks, a mosque in Joplin, Missouri, was burned to the ground. Many US Muslims are appealing to the media and their elected officials for help. Unfortunately, on some occasions, a few individuals like US Representative Joe Walsh, instead of offering hope to their Muslim constituents, are instead fanning the flames of hate. 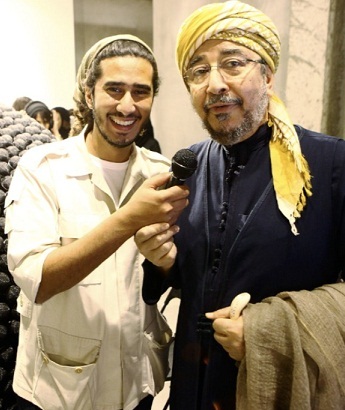 Sam with Dr. Safi Kaskas in Jeddah. 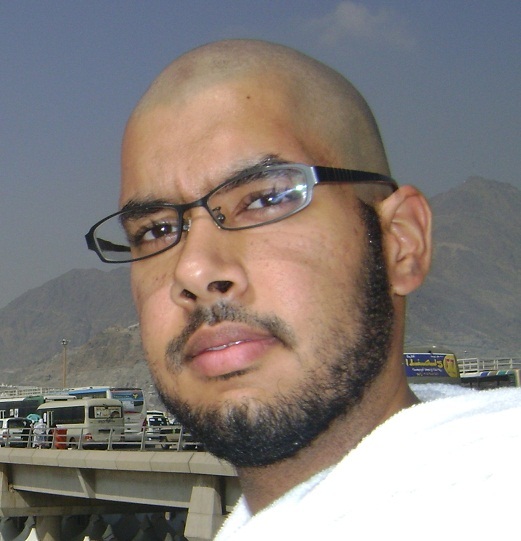 Safi is the president of the Association of Muslim Social Scientists in the US. 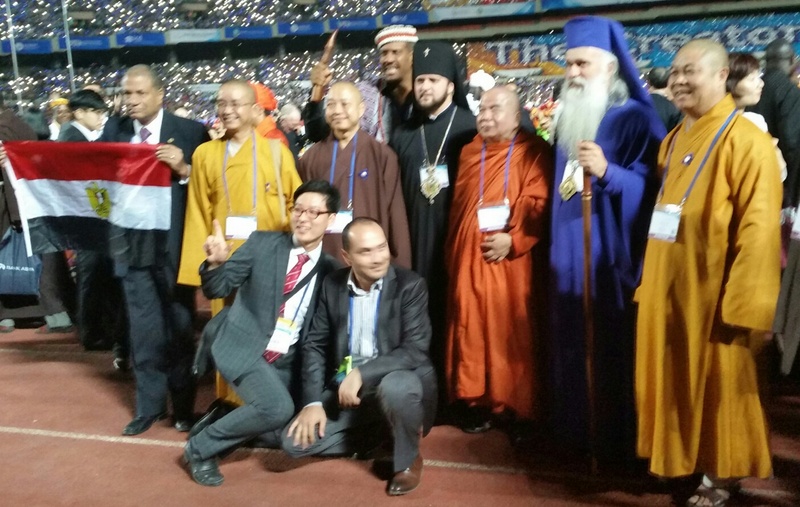 Safi has spent years building bridges of faith and understanding between the world’s Christians, Muslims and Jews. While it’s true that all three Abrahamic faiths (Jewish, Christian and Muslim) have their radical, violent elements; they are simply a noisy minority. They grab headlines by torching buildings or through inflamatory hate speech and through bombing and killing. Some US churches and Christian organizations, including Sojourners, an evangelical Christian outreach, have expressed solidarity with America’s persecuted Muslims and are organizing support for both the Joplin mosque and the Muslim community in Ever Green. The overwhelming majority of those who believe in the God of Abraham, are peace-loving, desiring freedom and democracy for all faiths. Recent polls indicate that greater than 80% of Muslim, Christian and Jewish teenagers and young adults want peace–not war. They have dreams of good jobs, families, homes. They want the best for others and seek to build bridges between their faiths and to support those who are persecuted or wrongly treated. 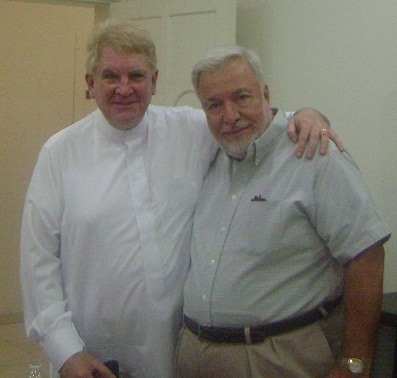 My work alongside Dr. Safi Kaskas here in the Middle East is in the field of religious reconciliation. Our work is vitally important to ongoing peace efforts, in the US, here in the Middle East and around the world. May we all do our part to improve understanding–to reach out to men, women and children; families and individuals who may express their faith differently. And may we vigilantly confront Islamophobia, anti-Semitism and anti-Christian hysteria with good information, loving kindness and hope for a much brighter, more prosperous future for all God’s children. 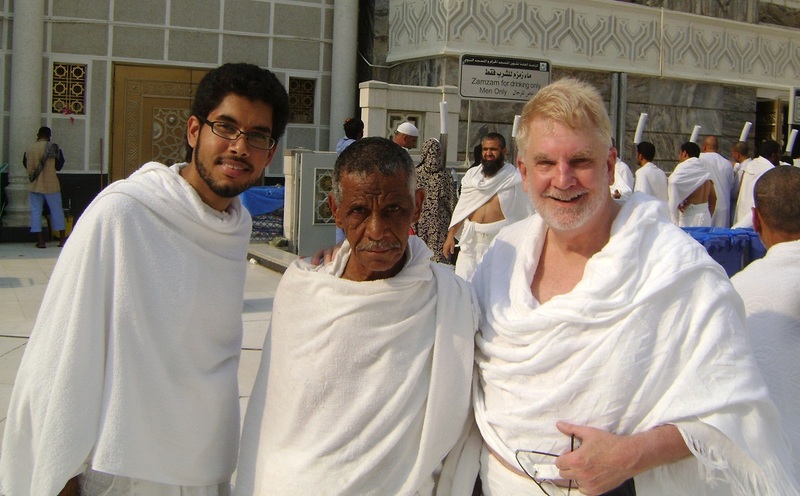 Here in Saudi Arabia I don’t hear church bells, but I do hear a very faithful, heartfelt call to prayer from many mosques five times a day. It’s a call to prayerfully thank God for his mercy and grace and a call to personal and world peace. 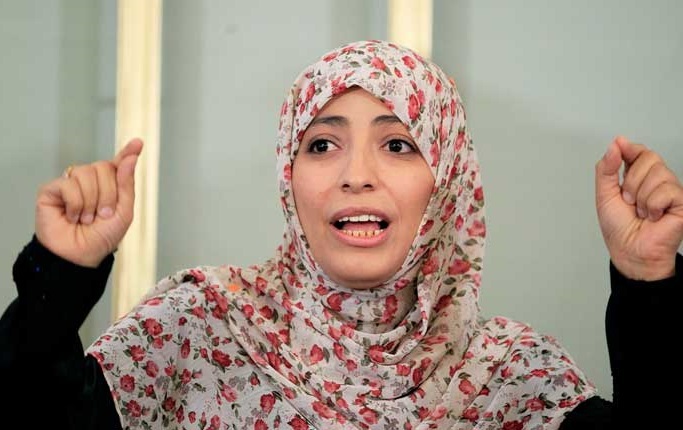 Saudi Arabia is surrounded by wars and conflicts (Yemen, Somalia and Sudan to the south and east; the Sinai, Lebanon and Syria to the north; Iraq to the northeast; and now a “pending” war between Israel and Iran. There are conflicts in other parts of Africa, and in Asia and South America. It would be easy to give up–to curl up comfortably in our own corner of the world; deaf to those who cry for freedom, uncaring and unconcerned. But that is not what God has called us to do. I thank all my Quaker friends for holding us in the light over here. 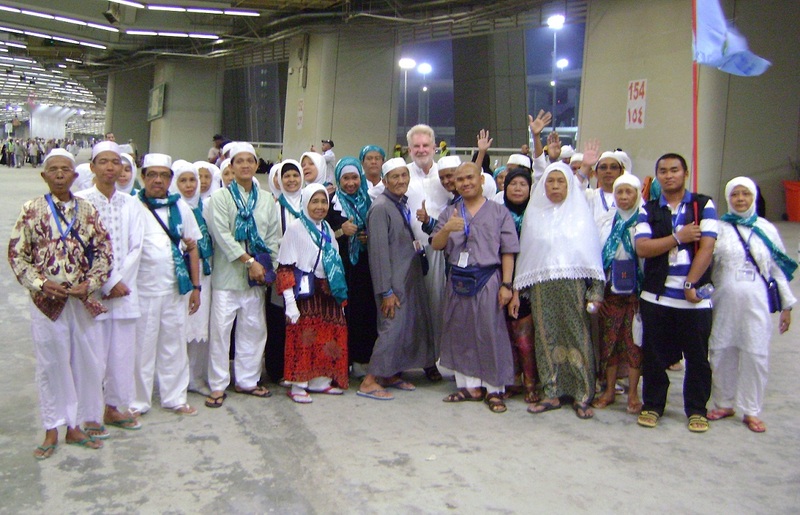 Your Muslim brothers and sisters here in Jeddah send you their love and greetings, and they join you in prayer for reconciliation and world peace. 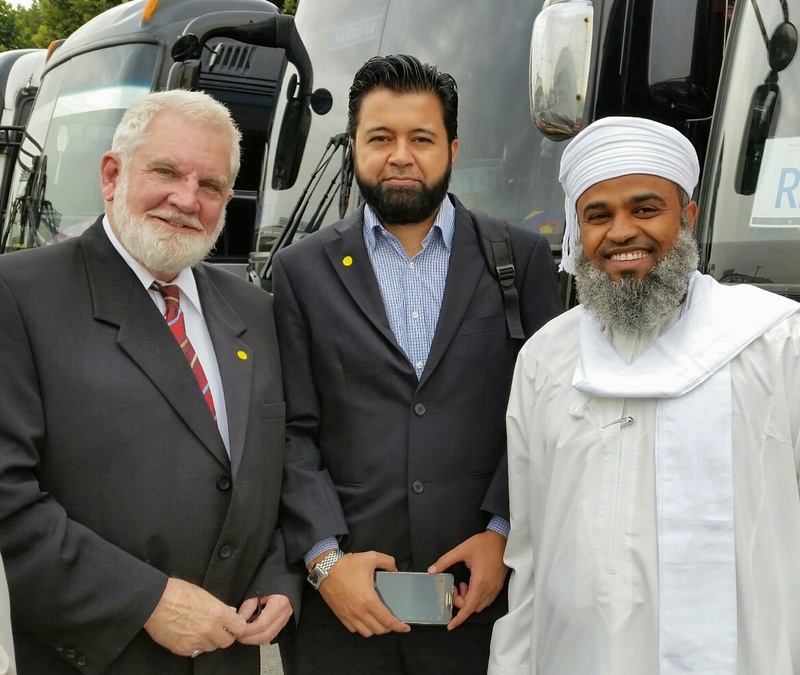 American Muslims in Washington rally to express their love and devotion to being citizens of the United States. Some of my readers will be surprised to learn that at one point in my life, years ago, I was a very dedicated young Republican. While I’m not proud of some of the positions I took back then, though I did make an effort to think my political positions through to a logical end. Some Republicans today make terribly specious arguments in arriving at whacky, potentially detrimental conclusions. I’m making this personal confession because of news reports I’ve been reading that Michele Bachmann, along with four other Republican members of the US Congress Trent Franks, Louie Gohmert, Thomas Rooney and Lynn Westmoreland, have asserted that the Muslim Brotherhood has “infiltrated the US government at the highest levels.” The five congressmen have sent letters to five federal agencies demanding an investigation of the Muslim Brotherhood and Muslims working in government positions. The ADL has written letters to these five members of the US Congress, expressing displeasure with their charges. 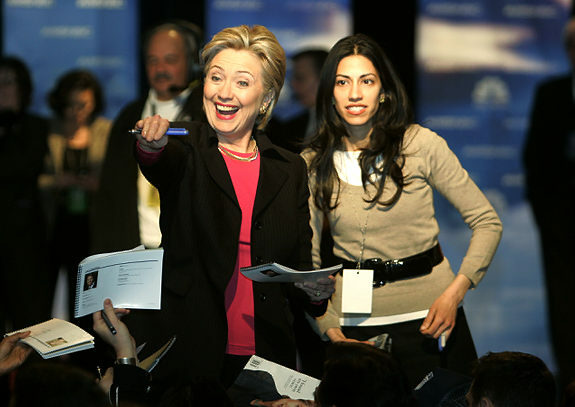 US Secretary of State Clinton with aide Huma Abedin. Abedin was singled out for attack by Bachmann and four other US congressmen. In their letter the five Republican congressmen singled out Huma Abedin, a longtime aide to Secretary of State Hillary Clinton. Abedin is married to former Democratic Rep. Anthony Weiner, who is Jewish and strongly pro-Israel. Republican Senator John McCain, not mentioning Bachmann or the other lawmakers by name, pointedly criticized their letter. Far too often, a few political leaders speak before they think. Facts don’t seem to matter. What does apparently matter to them is grabbing headlines with provocative anti-Muslim sound bites. But such ill-advised speculation is based on a closed-minded opinionating that “all Muslims are terrorists” or are “sleeper agents” just waiting for the their appointed time to blow up America. Sensationalism may get such people in the news, but these irresponsible individuals are putting American religious liberty and personal freedom at risk, endangering and marginalizing people’s lives–in this case the lives of millions of US Muslims. 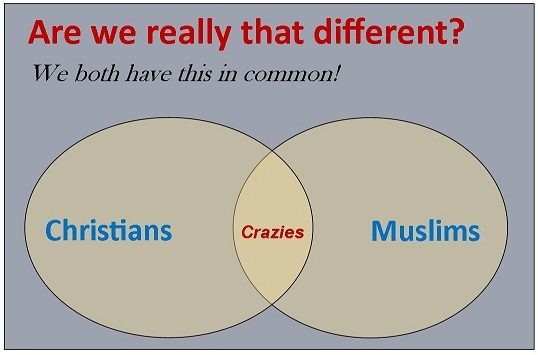 Extremism is common to all three Abrahamic faiths (Judaism, Christianity and Islam). Imprudent, incendiary rants are far too often effective at breeding further misunderstanding and paranoia–sometimes driving radical elements towards militias, violence, bombing, and killing. And many a home-grown terrorist has been born in reaction to hate speech and feelings of alienation. CNN’s Anderson Cooper entered the fray by televising a brilliant segment on his “Keeping Them Honest” program. It caught my attention this evening here in Saudi Arabia. In his program, Cooper totally debunks Bachmann and company’s latest conspiracy theory. 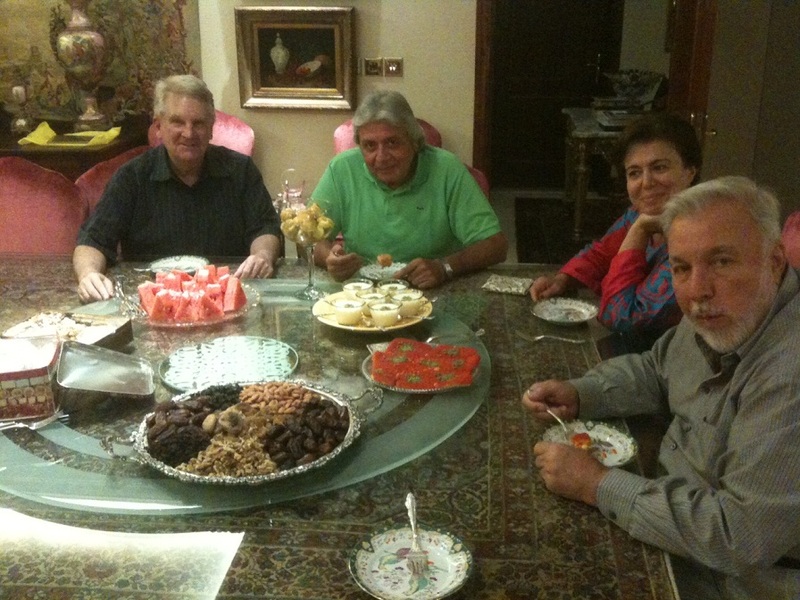 Sam “breaking the fast” on the second evening of Ramadan with Dr. Wael Saykali and Dr. Safi and Eman Kaskas. In all three major Abrahamic faiths (Judaism, Christianity and Islam) religious holidays play an important role in celebrating our faith in the God of Abraham. 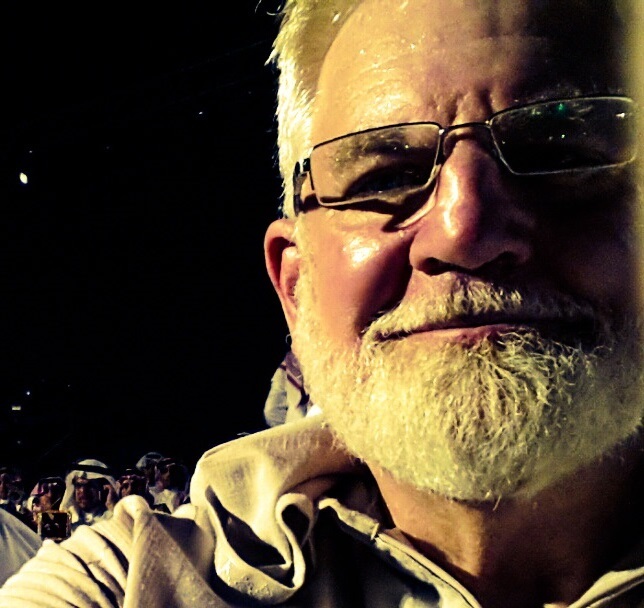 Here in the Kingdom of Saudi Arabia, I’ll be participating in my first Ramadan observance with my Muslim friends. There is an air of excitement as this holiday begins. Ramadan (Arabic: رمضان‎ Ramaḍān; variations Persian: Ramazan‎; Urdu: Ramzān; Turkish: Ramazan) has arrived. It is being celebrated July 20th through August 18th. It is the ninth month of the lunar Islamic calendar, which lasts 29 or 30 days according to the visual sightings of the crescent moon. Muslims around the world refrain from eating and drinking during the daylight hours. The thawab (spiritual rewards) of fasting are believed to be many, but during this special month, they are said to be multiplied. Muslims fast during this lunar month for the sake of demonstrating submission to God. 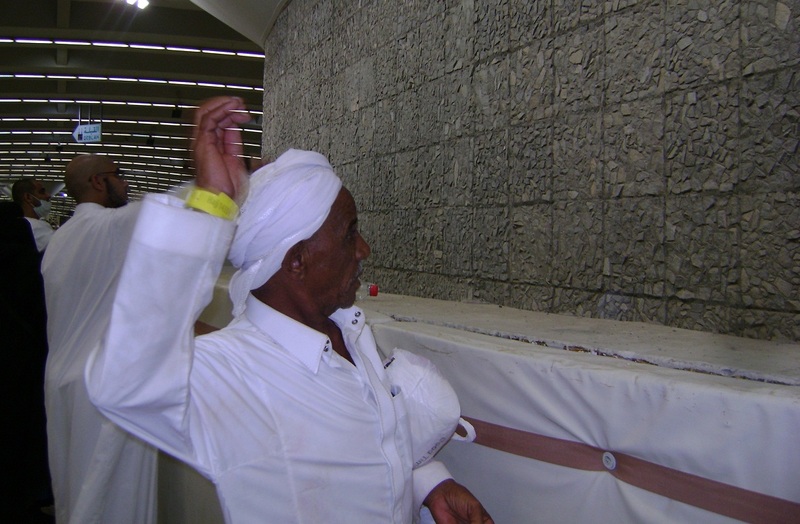 They also offer more prayers and Qur’an recitations. Each evening at sunset, families and friends will gather for the fast-breaking meal (or “break-fast) known as Iftar. The meal starts with the eating of three dates — just as Muhammad used to do. Then it’s time for the Maghrib prayer, which is the fourth of the five daily Muslim prayers, after which the main meal is served. Over time, Iftar has grown into large family dinners and even banquet festivals. This is a time of fellowship with families, friends and surrounding communities, but may also occupy larger spaces at mosques or banquet halls, where a hundred or more may gather at a time. High school students from Jeddah’s British International School unload more than one ton of food they collected to be distributed to poor immigrant families in their city. Charity is very important in Islam, and even more so during Ramadan. The zakat is obligatory as one of the pillars of Islam; a fixed percentage required to be given by those with savings. The sadaqa is voluntary charity and is given above and beyond what is required from the obligation of zakat. Muslims believe that all good deeds are more handsomely rewarded during Ramadan than in any other month of the year. Consequently, many will choose this time to give a larger portion, if not all, of the zakat for which they are obligated to give. In addition, many will also use this time to give a larger portion of sadaqa in order to maximize the reward they believe will await them on the Day of Judgment. In many Muslim countries, it is not uncommon to see people giving more food to the poor and the homeless, and even to see large public areas for the poor to come and break their fast. It is said that if a person helps a fasting person to break their fast, then they receive a reward for that fast, without diminishing the reward that the fasting person got for their fast. Even in non-Muslim countries, no matter how small the Muslim population, a consistent increase in charitable donations to both fellow Muslims and non-Muslims occurs during these days. In the US, for example, many Muslim communities throughout the country, participate in contributing food, clothes and non-perishable food items to local food banks and homeless shelters. Eman Kaskas with high schoolers from the British International School with some of the food that will be distributed to needy families during the 30-day Ramadan holiday. The British International School of Jeddah offers the International Bachaluriate (IB) program—a high school college preparatory degree that is recognized around the world. An important part of the IB program is Creativity Action Service (CAS) similar to community service programs provided by many American high schools. Students are required to do 150 hours of community service. This year students from Jeddah’s British International School collected more than ton of food that will be distributed during Ramadan to Jeddah’s poorer immigrant population. Eman Kaskas, explains, “It’s my hope that these students will fully understand the message they are sending with their gifts.” She says, “It’s like a mustard seed that we are planting today, and I’m very grateful to know that we’re planting it in good soil.” She wants these students to remember when they have families of their own, that they have a responsibility to raise civicly-minded children who will make an important contribution to society. Sometimes referred to as “the night of decree or measures,” Laylat al-Qadr is considered the most holy night of the Islamic year. Muslims believe that it is the night in which the Qur’an was first revealed to the prophet Muhammad by the Archangel Gabriel. The Muslim holiday of Eid ul-Fitr (Arabic: عيد الفطر‎, festivity of breaking the fast), sometimes spelled in English as Eid al-Fitr, marks the end of Ramadan and the beginning of the next lunar month called Shawwal in Arabic. This first day of the following month is declared after another crescent new moon has been sighted. This first day of Shawwal is called Eid ul-Fitr. Eid Ul-Fitr, may also be a reference towards the festive nature of having endured the month of fasting successfully and returning to the more natural disposition of being able to eat and drink. The following is a children’s Ramadan video that explains the spiritual significance of this Muslim holiday. Muslim children celebrate Ramadan in much the same way Jewish and Christian children celebrate Hanukkah and Christmas.